I am little by little beginning to love gold! It all began with my outdoor fall decorating and a single can of metallic gold spray paint. That's all it took. Now every time I turn around I find something else I think might look nice with a coat of gold spray paint. So, a little bit of gold here and there is slowly making it's way through our house. The latest room to receive a little gold treatment is our bathroom. I thought a few gold accents would look nice against the deep navy blue walls. I spray painted the photo frame hanging on the wall, and a plain glass cylinder vase that I picked up at Walmart a while back. I used painter's tape to create a design on the vase. 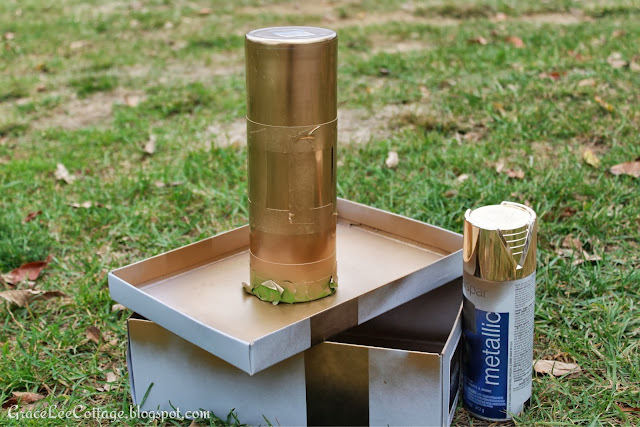 I grabbed a shoe box to prop it up on and my can of spray paint and gave the vase a quick coat. 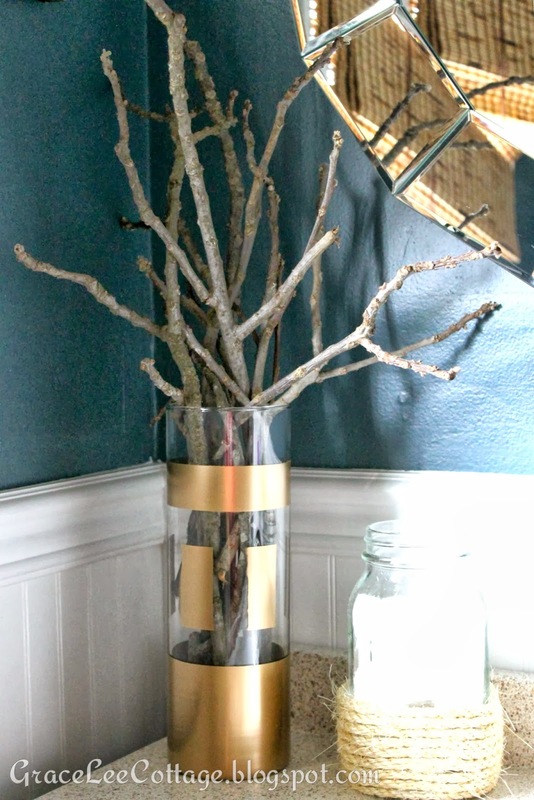 I picked up a few twigs from behind our house and placed them right in my new vase. Sort of a nice fall touch. 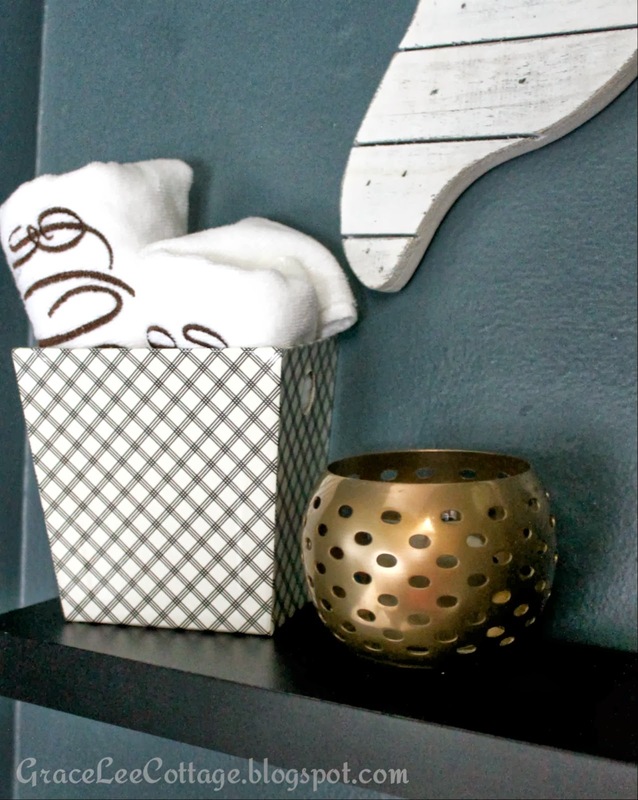 Lastly, I painted the little candle holder that once sat on the bathroom counter. It now hangs out on the black shelf hanging on the opposite wall. So there you have it. 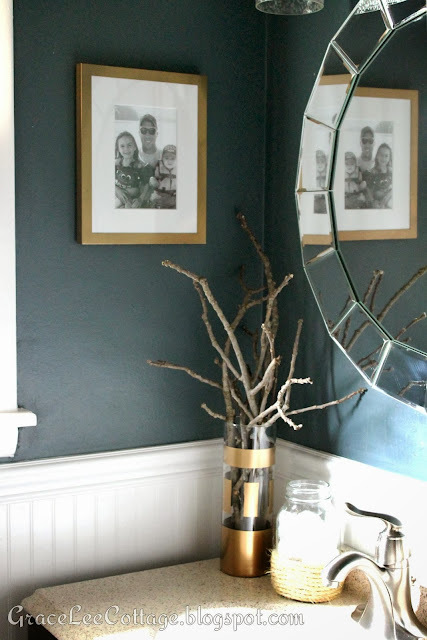 A little bit of gold in our bathroom! Too ironic, Leah...I have been incorporating bits of gold back into my decor, too! I've noticed it's back in style and it's also nice and "warm" for fall and winter. I was always more of a silver gal, but now I'm feeling the gold, too. 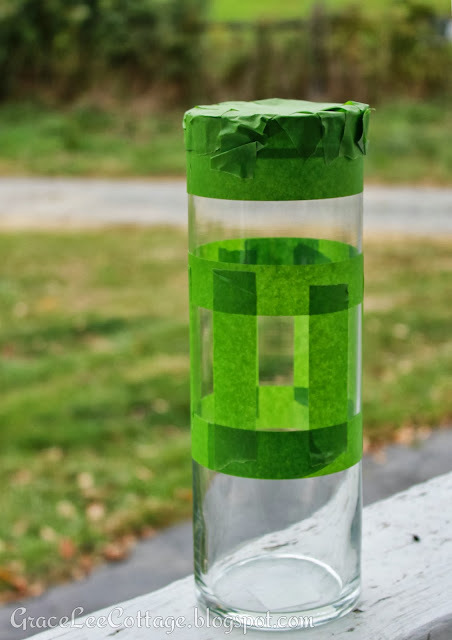 I love how you painted the glass vase with the gold - looks like a custom vase! Thank you Krista! I wasn't a big fan of gold either until recently. My mom had gold everything when I was little and I always said I couldn't wait to be grown up and have my own place to decorate with no gold! Now look at me! haha. I love it! Looks great!! I'm hoping gold sticks around for quite awhile!